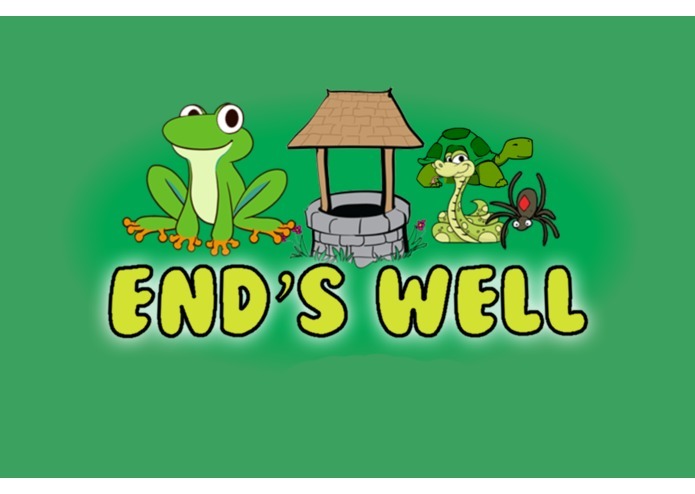 "End's Well" is a 3rd person adventure game, starring a courageous young frog named End. End recently escaped from his owner's aquarium, and has begun his quest to find the portal to freedom located within the deep reaches of the Well at the top of Park Hill. 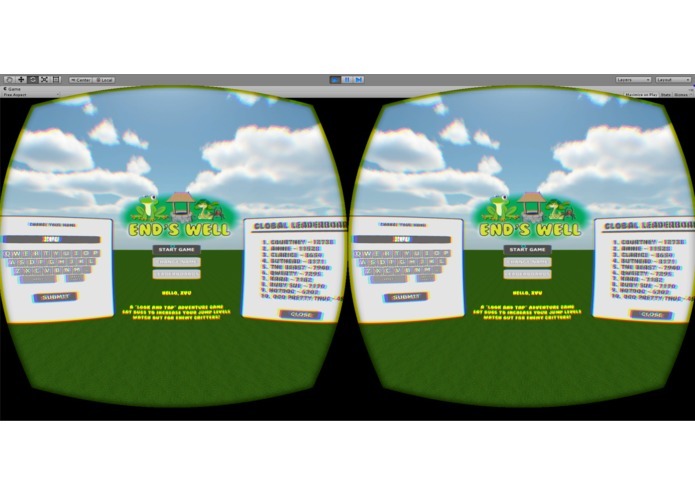 This title simply uses the touchpad on the side of the Gear VR, and the players gaze to determine where End should jump next. Jumping close to an insect will cause End to whip out his tongue and eat it, as frogs do. Eating increases End's jump abilities, therefore allowing him to reach higher areas, and ultimately finishing a level. Spiders, snakes, and turtles work against you, as you try to make your way toward your goal. The levels are bright, colorful, and simple. This game is geared (pun intended) toward players of all ages, and is currently being tested on a very excited 9 yr old. 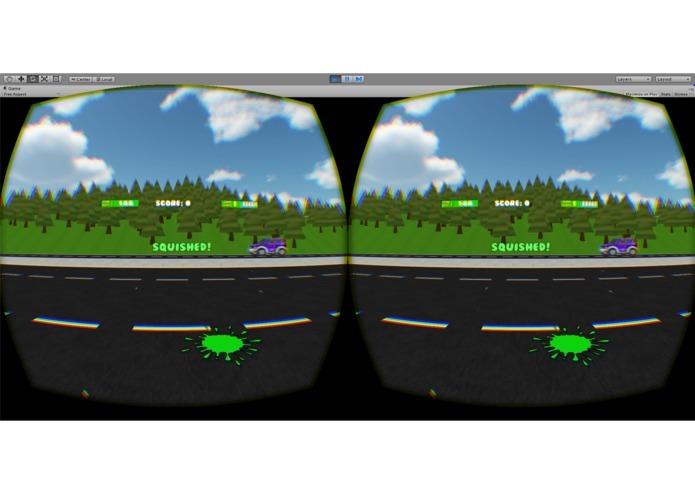 Basic game mechanic is ready to go. He eats, he jumps, and bad guys attack. 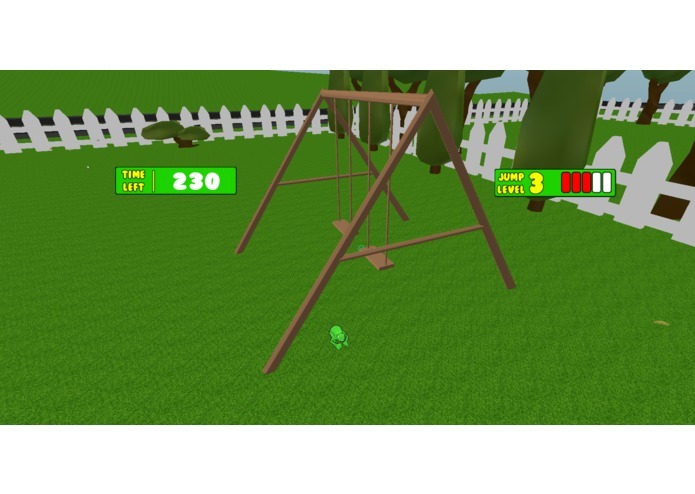 The on screen info is under development, and level design is the next challenge. I plan to have 3 levels in the game jam version, but expect that future iterations of the game can potentially have many more. Scoring and timer complete. First level design is complete with a clearer picture of what the full story will include. 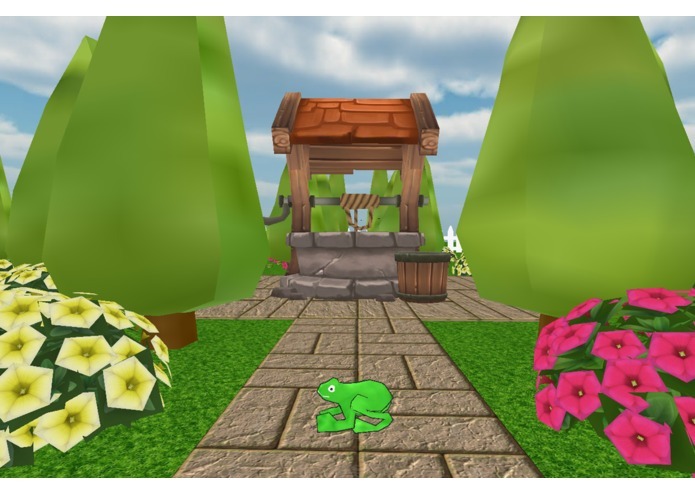 The frog will now escape the room, travel through the yard, across the road, and through the park to reach the Well at the end. Sound effects and music updated. Added additional screenshot of opening scene. Video will be ready for Milestone 3. Video is uploaded to YouTube and linked to Game Jam Entry. Video is not from actual Gear VR, but the game is fully running, so I plan on making an official trailer sometime next week. Game is fully functional now, just need to tweak a few things, and get fades working. Finalize a few pieces of art on the last level. Children are now fighting over who gets to be my beta tester. Runs smooth on Gear VR. No hiccups, or reported nausea. 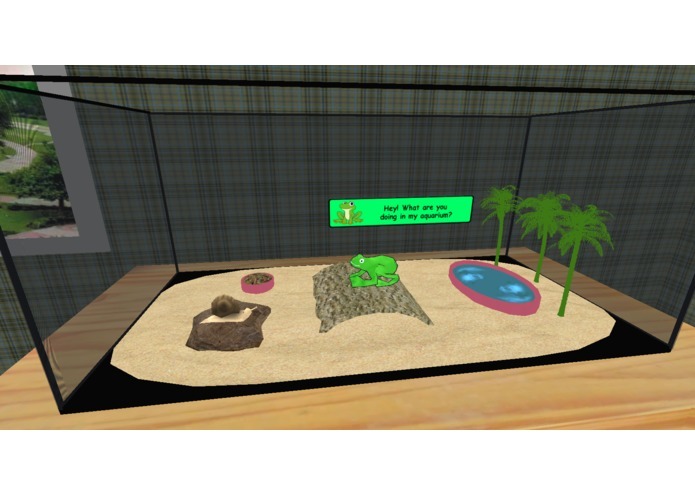 Lead a frog to freedom with your gaze, and a tap on the touchpad on the Samsung Gear VR. Eat bugs to increase your Jump Levels, and listen to the advice of your critter buddies along the way. Watch out! Time and enemies are always out to stop you. Reach the well at the end of your journey to win. Whew! Finally got a few things finalized and fixed. Game runs much smoother now, and hits 60fps. I implemented a Global Leaderboard, which means I also had to add scoring, and of course, a method to enter your name. Screenshots show that there is now a "Gaze Keyboard" and a "Global Leaderboard" on the main menu. I also felt like that back button was going to waste, so I made it pause the game and give the option to either CONTINUE, or go back to the MAIN MENU. 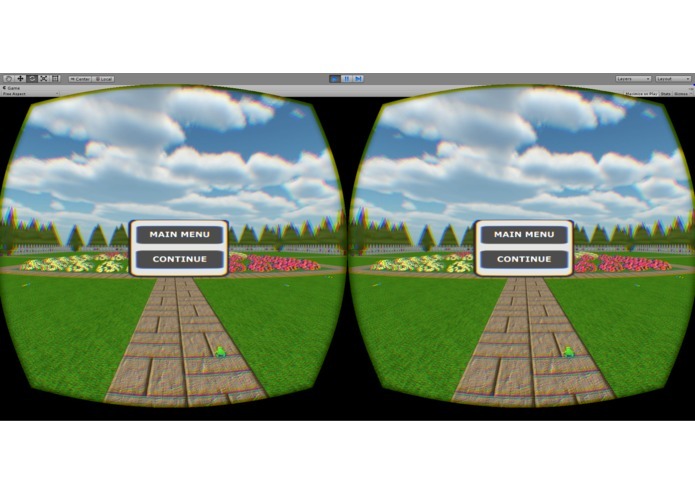 Now, I don't have to take the phone out of the GearVR to restart. CONTROLS: Tapping the touchpad cycles through the critters' dialogue. Once you start the level, look and tap. 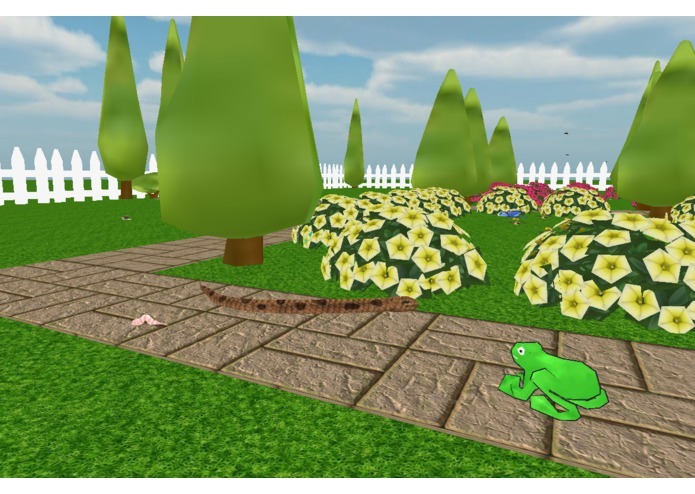 The frog hops toward the reticle. Don't feel like tapping the side of your head over and over? Then connect a Bluetooth controller and tap the A button on that instead, but still use your gaze to point the reticle toward your desired direction. 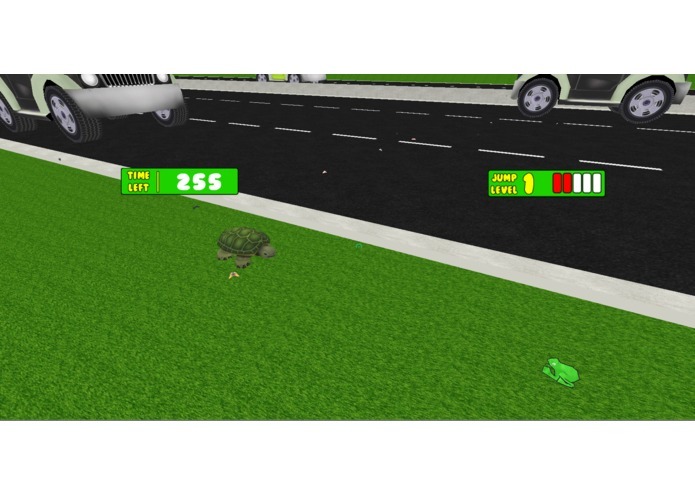 Eat bugs to increase your JUMP LEVEL to the max of LEVEL 5. At level 5, you will easily be able to make your way to the next level. Talk to your critter friends to learn more about each level. Watch out for spiders who will stun you (for 5 seconds), snakes that will eat you, and cars that will squish you. MECHANICS: This is a 3rd person adventure game. It is almost as fun as having a real-life remote control frog. The frog's tongue shoots out once a bug gets within reachable distance of his mouth. This can be a challenge sometimes since the bugs are constantly moving, or are flying higher than you can reach without a higher jump level. The great part about the camera script is that you really have no reason to spin around in your chair to play. Looking downward or to the left/right will easily give you the range needed to reach every part of the level. This could easily be played on an airplane without having to look strangely at the person sitting behind you. Each level begins with a quick conversation with a critter friend regarding your next steps, and a bit of humor. 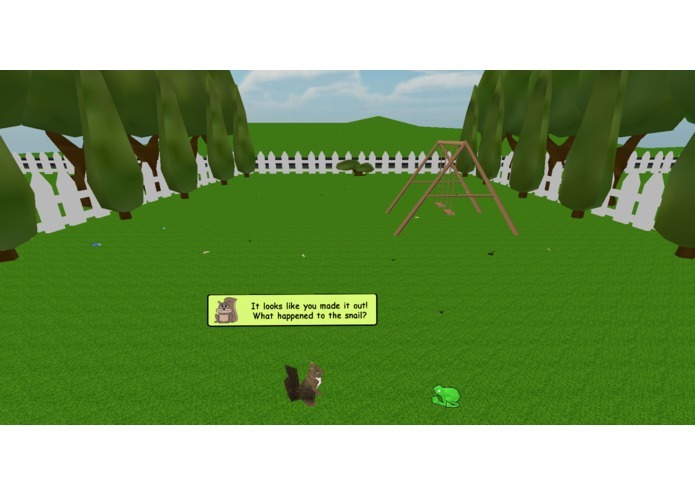 The critter friends are a great way to keep you involved in the story and give you an option to view the level before jumping into it. INNOVATIVE? First, kids love my game. 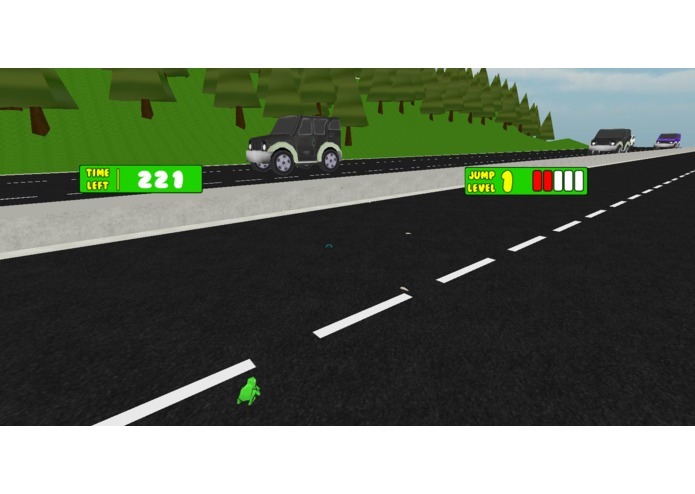 It has been referred to as "Frogger meets Animal Crossing", and that sounds like a good thing coming from a 9 year old. Not only does this game take full advantage of the simple, yet effective design of the Gear VR's touchpad interface, but it also provides an addictive and challenging experience. The story is cute, the colors are vibrant, and the objectives are easy enough that a 4 year old can understand them, but it can also frustrate a 35 year old (I have proof of both!). The Global Leaderboard means that people can see how they are doing compared to other players. 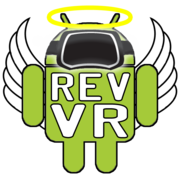 This leaderboard can also be seen at http://www.revvrstudios.com, and click on the SCOREBOARD tab. The formatting is still rough, but it works, and you can see where you stand in the rankings. I have left myself plenty of room for growth with this title. MANY more levels can be designed, and sequel ideas are already brewing in my head. FYI: I designed this on a Note 4 running Lollipop, so I know it runs on that version of the OS. It has NOT been tested on Kit Kat. VR Podcaster, Reverend Kyle. Creator of several game titles, including "Hack The Gibson".